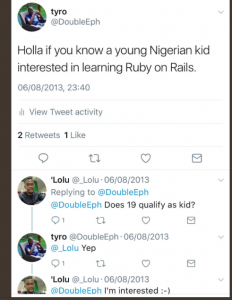 Lolu, a then 19-year old, first-year Computer Science student responded to the call and 3 tweets later, the discussion continued in e-mail inboxes. 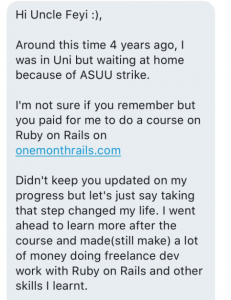 What we now know is that the altruistic Feyi sponsored the young man on a 1-month long Ruby on Rails software programming course at the cost of around $200, and heard nothing about him again. 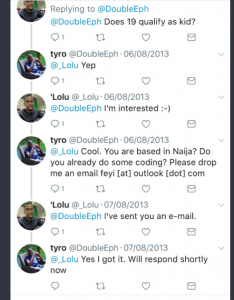 Fast forward 4 years, and the young man resurfaced to thank Feyi publicly. 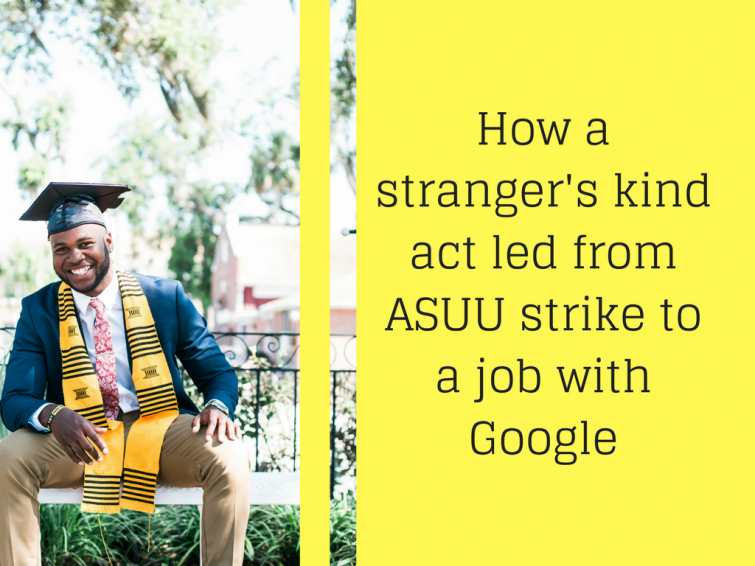 He went on to reveal that indeed that solitary act of altruism had gone on to provide him with a dependable source of income, while propelling him to graduate at the top of his Computer Science class and secure a job at Google 1 year after graduation! Since this morning when the conversation was first shared, it has been reshared/retweeted at least 750 times. This is testament to how strongly the story resonates in a country where the educational system has a primary objective to stagnate, to stall and to hinder the educational advancement of as many young people as possible. What this story also shows us is true magnanimity of young Nigerians in the face of the contempt of the ruling class. This is not a new movement. 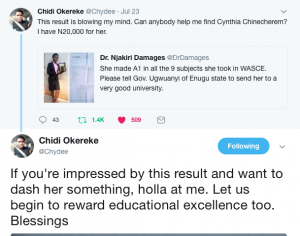 Barely a month ago, another Twitter user @Chydee appealed for funds and recognition on behalf of a bright 16-year old after sharing her awe-inspiring WAEC results. The Twitter family rose to the occasion and raised over N400,000 for the young girl to continue her studies. Now that the gift of another ASUU strike has thrust upon our young people, the time has come again for well-meaning Nigerians to make on these young lives, to the shame of the government. Whether you can offer temporary jobs, paid/unpaid internships, discounted training programs, or sponsored short courses, the story proves that a little support can go a long way. All the way to becoming a Google employee. 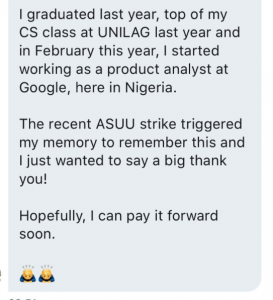 In the triumphant and ever-optimistic spirit with which our people have generated their own power, water, security, healthcare etc, a number of small startups and businesses have stepped forward during this strike to provide displaced students with training, internship opportunities and even temporary jobs. In this post, I will mention all the jobs and opportunities on offer for these students, and please feel free to mention any I might have missed in the comments section. UN, Abuja is looking for information management interns. This is suitable for IT students. Please apply using the link above. Tuteria is offering a paid full-stack development internship program in Lagoscentredd around Django Python, Reactjs/Angularjs. To apply, send a mail to jobs@tuteria.com. (International) TheMillions is looking for a remote intern for 1-2 hours each week. If you’re a voracious reader, culture vulture, and engaged writer who is very organised, please apply via the link above. A big Kudos to the MRpepe Crew.